Male anthropoid sarcophagus. However, its latest occupant was a woman called Taremetjenbastet, daughter of Ptahirdis. 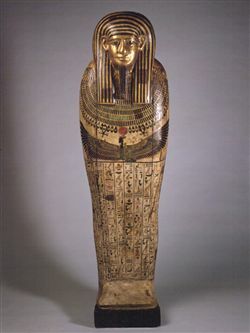 The face is covered by a golden sheet, revealing the deceased's conventional features: big eyes, wide nose, thick lips and projecting ears. A tripartite wig, with green and golden strips, covers the chest and part of the back. The false beard falls down over the wesekh necklace. Underneath, a goddess with opened wings, holding two ankh signs, introduces an inscription containing a Saite version of Chapter 72 of the Book of the Dead. On the back pillar, Chapters 640 to 643 of the Pyramid Texts have been copied.